Get ready for the streets of Sydney’s Liverpool to be transformed into a sea of stunning saris as the local council hosts it annual Starry Sari night on Sunday 21st September. Sydneysiders are set for an absolute Bollywood bonanza as the event celebrates Indian culture in the suburb that is the home of many spice stores, Indian restaurants and cultural dress stockists. Not only will there be an abundance of mesmerising on-stage cultural performances, but an array of local media personalities will be on hand for the festivities. The Voice Australia contestant Julian Simonz will be on hand as well as Better Home and Garden chef Fast Ed judging the Starry Curry competition. 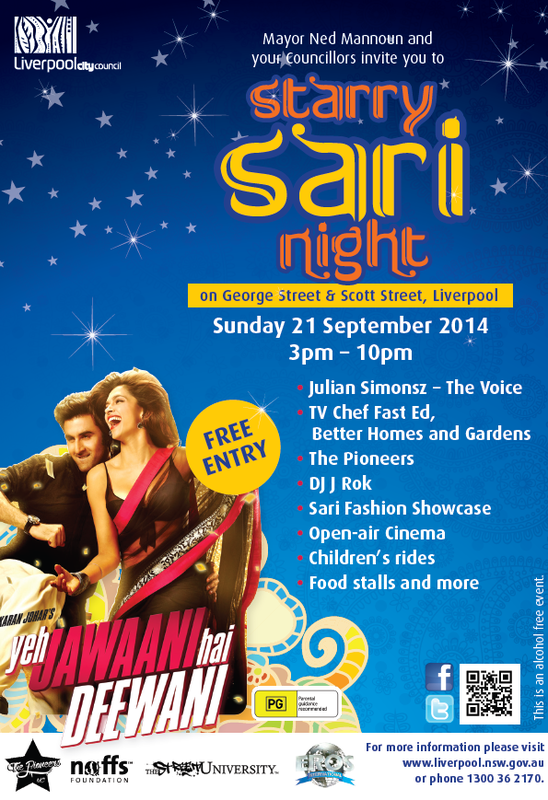 Make sure you join in on the Bollywood extravaganza from 3pm to 10pm on George and Scott Streets, Liverpool. More details on the event including an open-air cinema screening can be found here. And remember, if you do attention the event, feel free to Facebook and Tweet us with your comments and fun photos.